Philipp Veit (13 February 1793 – 18 December 1877) was a German Romantic painter. To Veit is due the credit of having been the first to revive the almost forgotten technique of fresco painting. Veit was born in Berlin, Prussia. He was the son of a banker Simon Veit and his wife Dorothea, daughter of Moses Mendelssohn, who subsequently left him to marry Friedrich Schlegel. Veit received his first art education in Dresden, where he was taught by Caspar David Friedrich, and Vienna. Although a prodigious talent when it came to drawing, Veit was not comfortable with oil painting. Therefore, in Vienna he took to working with watercolor. In Vienna, he made the acquaintance of Schlegel, and through him came to know several Viennese Romantics, one of whom was the poet and novelist Joseph von Eichendorff. He was strongly influenced by, and joined, the Nazarene movement in Rome, where he worked for some years before moving to Frankfurt. Veit participated in the struggle against Napoleon in 1813-14, returning to Berlin for a short period. In 1815, he finished the Virgin with Christ and St John, a votive painting for the church of St James in Heiligenstadt, Vienna. 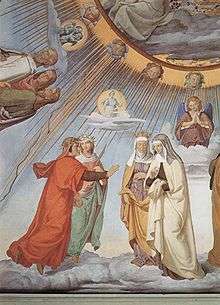 The painting was inspired by the style of Pietro Perugino and Raphael. 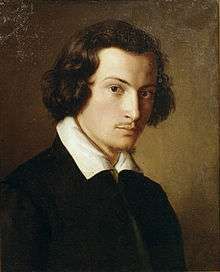 In Frankfurt, where his most important works are preserved at the Städel, he was active from 1830 to 1843 as director of the art collections and as professor of painting. From 1853 till his death in 1877 he held the post of director of the municipal gallery in Mainz. Like his fellow Nazarenes he was more draughtsman than painter, and though his sense of colour was stronger than that of Overbeck or Cornelius, his works are generally more of the nature of coloured cartoons than of paintings in the modern sense. Veit's principal work is the large fresco of The Introduction of Christianity into Germany by St Boniface, at the Städel. In the Frankfurt Cathedral is his Assumption, while the Alte Nationalgalerie of Berlin has his painting of The Two Marys at the Sepulchre. 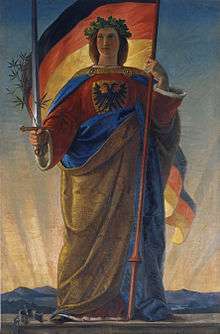 An example of his romantic work is Germania, a national personification of Germany, located in the Germanisches Nationalmuseum of Nuremberg. Wikimedia Commons has media related to Philipp Veit. 1 2 3 "Philipp Veit". Oxford Grove Art. Retrieved 11 March 2013.